We do offer services to help you re-home your family member but with so many stray, orphaned and abandoned animals, our resources can be limited and it takes the pressure off us if you can try to find your cat a new home. Remember, your cat is your responsibility. Even if you can’t keep them any more, your cat still depends on you to do what’s best for their future. It’ll take time, effort, patience and persistence to find them the right home. With over 200,000 cute, smart and trained animals euthanased (“put to sleep”) each year in Australia because a home can’t be found for them, making your cat stand out from the crowd isn’t going to be easy. People should not rest all their hopes on the assistance of shelters such as ours however, as the work involved in re homing your cat is still ultimately up to you! So if you have read this far and still think that re homing your cat is the best thing to do then the following information will help you find the best home possible. Do you really have to give up your cat? Sit down and have a good think about it. Do you really want to give up your cat or is it just more convenient? The easiest way isn’t always the best way. Would you give up your child so easily? Most problems, whether they be behavioural or circumstantial, can be overcome if you are willing to put in some effort. Below are some of the most common reasons for surrendering a cat and how to overcome them. The biggest reason for cats being surrendered to shelters is due to rental property owners not allowing cats. If you have to move and renting is your only option then don’t give up too easily if you are having trouble finding somewhere that will accept cats. Try expanding your search to areas you had not yet thought of, or visit this website for pet-friendly rental accommodation: www.petfriendlyrentals.com.au. Cats won’t dig up your yard, bark or chew things in the house, are fastidiously clean, relatively smell free, and have as much fur to lose as any other animal that may be permitted in rental properties (including yourself!). These are all valid points that can be made to rental property owners when applying to live on their property. Having a baby and introducing them to the existing cats in the house can be smooth and hassle-free… or a very stressful time. Don’t despair! It doesn’t necessarily mean you have to give up your feline friend. Cats that have never had exposure to babies or young children often don’t know what to make of them. They will either ignore it or take more interest than you would prefer. To cats the baby lying on the floor rolling around is a great little play thing just like string dangled in front of them. They also see the baby as a wonderful source of warmth and may climb into the cot to snuggle in with the ready made hot water bottle! These are all natural responses for a cat but they do set off alarm bells for many parents. The other big concern with cats and having a baby is toxoplasmosis. Cat faeces can carry a parasite that causes toxoplasmosis, an infection that isn’t serious for you, but might be dangerous for your developing baby. Eating raw, cured or undercooked meat is the most common source of this infection, but cat faeces can also pose a possible risk. Some doctors will immediately tell you to get rid of your cat but this is an overreaction and a lack of understanding on the doctors part. Use gloves when emptying the litter tray and wash your hands afterwards, or get someone else to deal with the litter tray while you’re pregnant. Empty the litter tray daily. If you’re concerned that you may have been exposed to the infection, you could ask your GP to do a blood test that will tell you whether or not you’re immune. You can also ask your vet to test your cat to see if he has been infected with toxoplasmosis. If it proves positive, you might decide to put him into a cattery for six weeks until he is no longer infectious. It’s an unfortunate reality but adults and children can become allergic to cats. Sometimes it develops spontaneously, sometimes a new housemate or partner brings a cat into the mix, sometimes. Ideally, re-homing should would only be considered if their allergies are bad enough to be dangerous to the health of the person involved. If you are considering adopting a cat for the first time, try house sitting for a friend that has cats so you can test if you have allergies. You can also spend time at your local cat shelter so you can assess how severe your allergies may be if any. There are so many products for people with allergies that giving up your cat should be a last resort. Talk to a doctor who is sensitive to your feelings and who is willing to work with you, or the person in your house with allergies, to find a solution that doesn’t involve giving up your beloved friend. Giving up your cat should be your last option as opposed to your doctors first. Cats are usually very independent animals and are quite capable of entertaining themselves while you are at work or busy elsewhere. Unless your cat has a particularly needy nature and their wellbeing really is being compromised then re-homing should only be a last option. If you love your feline companion then you can always find time to give them! When choosing a cat be aware of how much time you think you will have to spend with them and choose a kitten that has an independent nature that won’t fret while you aren’t home. Consider adopting two compatible cats to keep each other company, with the added bonus of having a friend to groom all those hard-to-reach places! To keep your cat entertained while you are away from them, provide an enriching environment. This can include scratching posts, empty packaging, toys, cardboard boxes, and treat balls filled with their favourite goodies. Allocate a time each day to spend with your cat as if you would a child. Even if it’s only 10 minutes make it count by doing something with your cat that you both enjoy, such as brushing or playing with their favourite toy. If your cat has a behaviour problem(s), chances are it’s a common and manageable one. The most common problems include inappropriate urination/spraying in the house, scratching furniture, aggression towards other cats and anxiety issues (often leading to the above behaviours). Have your cat checked by a veterinarian to rule out any physical health problems that may be causing these behaviours. Is this a new kitten that has not been properly toilet trained or taken away from its mother too early to learn what is right and wrong? Have you just moved house and the cat is trying to establish his new territory? Have you brought new furniture, a baby or a person into the house recently? Have you changed the type of kitty litter the cat is used to using in their tray? Do you clean out the kitty litter tray regularly enough? Questions such as these need to be asked of all behaviour problems your cat may have and need to be thought about so you can set about trying to rectify them. Your vet can also help you do this and there are many websites available to assist you in researching what is happening with your cat, (please be sure to consult your vet or 9 Lives before taking any advice on cat behaviour from the internet). Essentially there is no need to give up your cat if your willing to put in the time and effort to understand them and why they behave the way they do! Obviously you want your cat to go to the best possible home you can find. You want them to be cared for the way you would care for them and not be rehomed again shortly after being placed with their new family. Most of all you want to make sure they don’t spend a lonely night in a cold cell only to be killed in a conveyor belt of euthanasia’s the next day by a complete stranger. That is why the best way to rehome a cat is to do it yourself. Be aware that finding a new home may take a while! 1. Who Best Suits Your Cat? Does your cat prefer to be indoors, outdoors or both? Does your cat like children and if so what ages are best? Does your cat get along with other animals such as cats or dogs? Does your cat prefer to have company or are they independent? Does your cat have any medical problems that need to be addressed? Does your cat need daily grooming? Is your cat energetic/playful or quiet and sedate? Shelters will not send cats to new homes without these basic requirements and neither should you. Sterilising your cat prevents unwanted pregnancies from increasing feline overpopulation as well as preventing some health issues, updating vaccinations protects your cat from potentially fatal diseases and microchipping can reunite families with their cat should they get lost. Having these procedures done increases your cats chances of being re-homed. If your cat has already had the procedures listed then we still recommend you have your cat health checked to ensure that everything is in working order and so you can ensure your cats new family have all the information about the cats health. At a health check the vet will check your cat for any lumps and bumps, lameness, internal organ abnormalities, weight, parasite control, eye/ear problems and their teeth. When you place an advert for your cat, include information on your cats personality. Are they affectionate, placid, a lap cat, independent, playful, outgoing or shy? Does your cat have any quirks that make them unique? Also state your cats likes and dislikes, such as sleeping on the bed with you or not wanting to be being picked up. Also include any special needs your cat has such as being brushed each day. Refrain from putting information about any medication needed as this can be discussed when the person meets the cat. You often need to get people through the door to see your cat before allowing them to pre-judge based on a medical condition. Make sure you get a photo of your animal that is clear and focused. This can take time and patience but it will be worth it when you get that perfect shot. 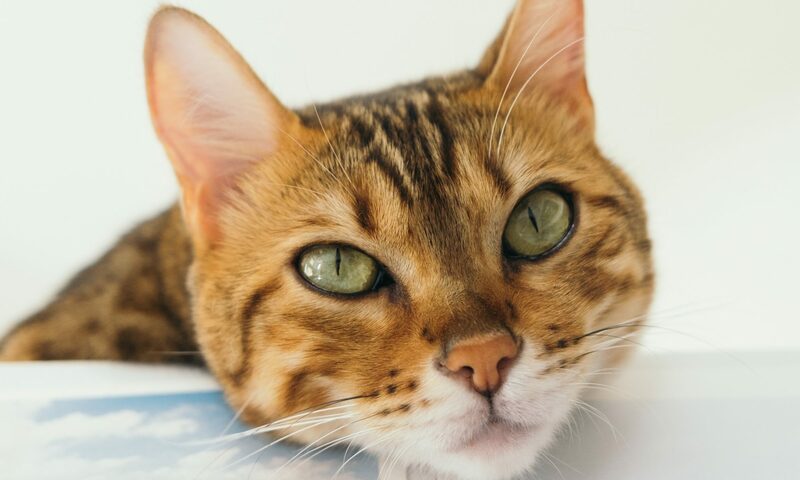 Try to get a close up of your cats face as well as a body shot to show off your cat to their absolute best! Bright, natural lighting is generally the best household lighting to take photos in. Always set an adoption fee. This shows people that you value your cat but also attracts people who will value them too. This cost can range anywhere from $50-$150 which can cover your advertising or veterinary fees. If people aren’t willing to pay an adoption fee then you need to consider if they are really ready for the financial responsibility of having a cat and if they would be willing to spend money on them should health problems occur later in life. Never advertise as ‘free to a good home’ as you may be giving your beloved family member to someone who will sell them to make a ‘quick buck’ or again will attract people who aren’t willing to spend money on your cat should they need medical attention in their lives. In this day and age the Internet is the biggest resource people use to find what they are looking for. These are the best sites we have found to advertise on. The classifieds can also be used to advertise your animal. Often it is the weekend papers that attract the most interest so try using the West Australian or Sunday Times. The Quokka is also an option but it does tend to attract people wanting freebies. Although you can only write a brief ad for the classifieds, make sure it is short, to the point and gives as much information as possible, e.g. If you’re a member of a church, club or group, ask if you can include an advert in their newsletter or on their noticeboard. Put up flyers in your local supermarkets, vets and community centres. Email a flyer to all your friends and ask that they put it up on their work noticeboards. Some rescue groups will allow you to put a flyer up at their premises for free or a small donation. Once you have your ad placed you need to be ready to take calls and emails enquiring about your cat. Don’t just let anyone take your cat home because you know nothing about them or what they may do to your cat. Remember that it is your responsibility to ensure your cat’s wellbeing beyond your care. Whether you are contacted by phone or email it is a good idea to have a list of questions to ask them so you can assess their suitability to your cat. Set up a room in your house that you know your cat will be comfortable in. Ensure there aren’t too many hiding spots in the room but that there is still somewhere for them to go so they feel safe while these strangers are in their space. When the people arrive to meet your cat, usher them in to the room you have set up and allow them to get comfortable. Give them a food treat that you know your cat loves so that they can bond with your cat when meeting. Bring your cat into the room and place them in front of their visitors at a distance that is comfortable for your cat so he/she can get used to these peoples presence. Encourage the people to let your cat sniff their hand and offer their food treat. Depending on your cats nature they will either be very social or shy but make sure your visitors aren’t too loud and don’t try to do anything against the cats will such as pick them up straight away. Make sure you observe the way the people interact with your cat as it can say a great deal about what type of companions they will be. Trust your instincts and your cats as they will know what’s right for them. If the meeting goes well then arrange for a trial period of 1 to 2 weeks. This allows you and the interested party to assess if the cat is going to suit their new home. You can use a Trial Adoption Contract, to legalise the agreement. This will mean that if you decide that the people who want to give your cat a home are not suitable then you have the right to reinstate your ownership rights and set about finding someone else to home them with. Remember you do have the right of refusal if you feel the people are not suitable for your cat at the time of interview, during or at the end of the trial period. It also helps if the people decide that the cat does not suit them, then they can return them with no issues. You can also opt to do a home check before starting the trial period so you can make sure that the house and lifestyle of your cats potential new family is suitable. This is something we highly recommend before starting a trial period. Call the your cats trial family a few days into the trial to ask how the cat is doing and if they have any questions. If all is going well then wait until the end of the trial period and make an appointment time to visit your cat in their new home. If you decide that your cats new home is just what you want for them then make a Permanent Adoption Agreement ( here is a sample of what we use). This will transfer your ownership rights to your new cats family. This means your cat is now officially rehomed! It’s normal for the cat not to eat for a few days. Keep providing fresh food and water everyday for when the cat is ready to come out and eat. It is also important to put their feeding bowls in an area that doesn’t have to much noise or human traffic around it that may scare the cat while they are trying to eat. Don’t force the cat to do anything it doesn’t want to do e.g. brushing, pulling out of their hiding place or bathing. This will just stress the cat and create mistrust. Be gentle, be patient, let the cat choose to come to you rather than chasing after it for cuddles. The cat may forget their training. Remember they are stressed and may have an accident but this usually only happens once before they learn where their kitty litter is and they feel safe enough to venture out and use it. If a stray cat has befriended you or you have caught one then very important to make sure that it doesn’t belong to someone. If you rehome the animal without checking its ownership then you’re rehoming someone’s cherished friend. See if it has an ID tag on a collar with details that you could call. Contact your local vets – they can microchip the cat to see who its owners are. They can also take a description of the cat and your contact details at a few local vet clinics. Cat Haven also have a lost and found registry for a nominal fee of $10. Door knock with a photo of the stray cat. Put posters up in your neighbourhood – lamp posts, local shopping centres, letter box drops and traffic light poles. Put an ad in the local paper of your area. Include a brief description of the cat, where it was found and when and your contact number. What if I can’t hold onto them? Ask a friend or family member if they can mind the cat. Contact us and if we have foster carers available we will put them in care until the owners are found. Should they not be found then we can help you to rehome them. Go to your local vets. Most vets will be willing to hold the animal for a time while you try to find their owners. You can also enlist their help in finding your strays family. If you want the cat to live and have a chance at finding their family then we do not recommend taking them to a shelter that euthanase (“put to sleep”) cats. They are obligated to hold the animals for a minimum of 72 hours and after that time the animal might be put to sleep. It would be horrible to find that you had just located your cat a day too late and they were no longer alive. Have you found the real owner? Should someone contact you in regards to the stray cat then you need to make sure they are the real owner. When putting up posters leave out a couple of important details that only the owner would know – such as distinguishing markings. Ask them these questions when they enquire. You can also ask them to bring a photo of the animal they are claiming is theirs. Watch the way the cat interacts with them when they come to collect them. If you aren’t sure then ask them for the details of their vet. You can contact them to confirm if the animal does visit them and match it up with any ID the person has with them. Never hand over a cat to someone who claims that it is theirs without proof of ownership, or their real owners may never see them again. What if the owner isn’t found? If no one comes forward to claim the cat after 2 weeks or more then it is safe to say that they have been abandoned and you can set about rehoming them. For assistance on rehoming please see our article. Even as cat lovers we understand that sometimes you can have unwelcome guests spraying on your doors, tormenting your caged birds, starting cat fights on your front lawn or pooing in your kid’s sandpit. Sometimes these cats are owned by your neighbours, stray or feral. Regardless it must be remembered that cats are still living creatures that are just doing their natural thing and that there are humane ways of deterring them from your property. When you have a constant issue with cats in your neighbourhood try the following. If you know who owns the cat, talk to the owner. Often they will be apologetic and will make an effort to rectify the problem by keeping their cat contained. Some councils have a cat curfew, and the cat must be indoors between certain hours. So it is worth calling your council and finding out what, if any, laws they have in regards to cats roaming. This information can be passed onto the owner of the cat. Cats prefer to dig in loose dirt. If you have a small area try placing some pebbles in the garden beds. Pine cones also act as a deterrent as cats don’t like the feel of them on their feet. So try adding some to your mulch & spread around flower beds to keep the cats away. Citrus is unpleasant to cats, so if the neighbourhood cats are zoning in on a smallish area, you can try putting orange, grapefruit or lemon peel in this area. Chilli Powder also works to make cats avoid certain areas. Place netting on the ground, especially in areas where there is freshly turned over soil & or seedlings. Chicken manure around established plants can also deter cats as they don’t like the smell. For children’s sandpits cover and secure a tarpolin over the area to not only protect it from being a cats large litter tray but also to stop birds pooing in it as they carry many diseases. If you have a bird feeder in your garden, make sure it is hung up in a location which is difficult to get to for cats to reduce their chances of catching birds. Combine all ingredients in an empty two litre bottle, and leave mixture overnight. Fill a spray bottle and spray around the area that you wish to deter cats from. Keep the remaining mixture for later. You don’t need to spray much to give the cats the hint. Just respray every week or two until they disappear. Be aware that this recipe has a very unpleasant odour, so do not spray in the house or near open windows, and do not spray directly onto the cats. CATWatch is an Ultrasonic Deterrent that actually trains even the most persistent feline visitor to stay out of your garden for good. CATWatch has an ultrasound alarm which is triggered by the cat’s movement and body heat as it enters the protected area. As soon as the cat leaves the protected area the alarm stops and therefore the cat soon learns that to prevent the ultrasonic alarm the area MUST be avoided. Specifically designed strips of plastic spikes can be purchased and fitted on top of fences, shed roofs etc to prevent cats from walking on it. The thorns are designed to maximise discomfort without unnecessary harm. Thorny Devil Fence Spikes can be fitted quickly (around 1-3 minutes per metre). Intruders are warned 3 ways by sight, sign and touch, before they try to climb. Scarecrow senses animals the same way security lights detect people; movement and heat. When an animal is seen, a valve opens instantly releasing a three-second pulsating spray of water. The combination of the sudden noise, movement, and water frightens animals away. The natural repellent found in Shake-Away granules will repel cats without harming them.